To prepare for Denis Villeneuve's Blade Runner 2049, I finally forced myself to watch Ridley Scott's 1982 original Blade Runner this week. While I didn't HATE the movie as much as others (Omar), it certainly was not a memorable entry in Ridley Scott's filmography. I did really like Scott's vision of the future with congested cities, flying cars and loud, vibrant billboards. The score from the original Blade Runner (synth-heavy by Vangelis) was also well-done and added to the tone of the film. Thankfully, Villeneuve (who directed recent gems with Sicario and Prisoners but faded a bit with Arrival) takes all of what I enjoyed in the original film and ramps it up exponentially into a truly vibrant and visceral experience. The music, sound, acting, effects, really... EVERYTHING that makes up Blade Runner 2049 is satisfying and the result is nearly three hours of retro-futuristic WOW that immerses the viewer and transports us to another time. Despite the brilliant visuals of Villeneuve's world he crafts, the plot of the film is important here and builds off of the events at the end of the original film. Ryan Gosling plays K, a Blade Runner (a detective who seeks out to kill rogue replicants *androids*) who is also an android himself. We watch his interactions with his boss played with gusto and gumption by President Claire Underwood Robin Wright. In an early scene we see his dedication to his job as he pays a violent visit to Dave Batista (this guy is going to be a movie STAR) at a desolate location and uncovers a key plot point. Gosling is really good in this movie and gives just enough of emotion to show that a hint of heart exists in his android body. Harrison Ford is indeed in this film reprising his role as Rick Deckard from the first movie. We don't see Ford though until about two thirds of the way through the movie. His presence helps tie the events of 2049 back to the original and we even get some sequences with a CGI Sean Young as the replicant Rachel. Ford is solid, but you can see that his action-movie days are numbered as a 75-year old actor. The acting across the board is so good in this movie and two virtually unknown female stars contribute in a major way. Ana De Armas plays Joi, a hologram female companion of K in a role slightly borrowed from Spike Jonze's Her. De Ajos gives a beautiful performance as she helps add an emotional layer to Gosling's character. Luv, an assasin / assistant of the evil Wallace Corporation is played by Sylvia Hoeks. I had never seen Hoeks in a film before and actually thought her character was being played by Pauley Perrette (similar bangs and hairstyle). Hoeks has much more range than Perrette thankfully and totally killed her nuanced performance adding in fits or rage mixed into a calm exterior. A cameo turn by Edward James Olmos (who plays an older version of his character in the original) and a creepy, passionate acting job by Jared Leto (as the sinister tech corporation boss) help round out the talented cast. I have to talk about the living legend Hans Zimmer for a few moments. The score in this movie is sooooo good. Pulse-pounding and over the top at times and cues that are spot on with bringing you into this futuristic landscape. If Zimmer does not win his second Oscar for either this film or Dunkirk this year, it will be a crime. The man simply adds so much to the movies he scores. The combination of Zimmer's future-symphony paired with cinematographer Roger Deakins' (THIS MAN NEEDS AN OSCAR TOO after 13 nominations and NO WINS) vast epic sprawling shots of cities and wastelands is a total joy to experience. I feel that this movie will be looked at fondly for years as science fiction done right. The vibrant visual joy I experienced in watching this film reminded me of the way I felt taking in the neon-glowing world of Tron Legacy years ago. Future-done-right can be very powerful thanks to the advances in technology we have today. This movie MUST BE SEEN on the big screen. Much like Dunkirk. In fact, I currently cannot choose between Blade Runner 2049 and Christopher Nolan's WWII epic for my favorite film of 2017. Both movies just stand out so much and affected me in similar ways. Total immersion for the audience in both situations and that's exactly when Villeneuve and Nolan set out to do. They both utilize Zimmer's talents to the fullest as the score for each movie PERFECTLY compliments the on-screen visuals. If you are even remotely a fan of science fiction (and whether you've seen the 1982 original or not), go out ASAP and see Blade Runner 2049 in the largest, loudest theater available. 5 out of 5 JRs for another amazing accomplishment from a visionary director. It's unfortunate that this movie did not succeed at the box office. Much like Ridley Scott's Alien Covenant, perhaps the public is just not into these sci-fi sequels. I hope the lackluster returns do not prevent either auteur from pursuing more science fiction projects. 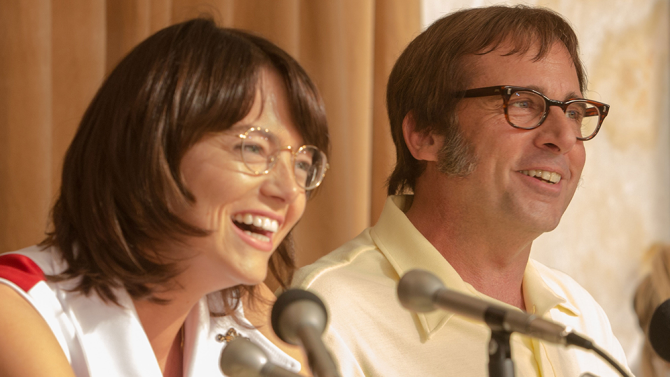 Earlier last week I used my glorious MoviePass for the first time since the price drop and took in Emma Stone and Steve Carrell in Battle of the Sexes, a re-enactment of the famous tennis match and (preceding build-up) in the Astrodome in 1973 between Billie Jean King and Bobby Riggs. While not totally remarkable, I definitely enjoyed the slice of 70's from directors Jonathan Dayton and Valerie Faris that showcases one of the finest actresses of her generation in Stone. While it was a bit difficult to morph the gorgeous Stone into a near spitting image of a young BJK, it worked and Emma's performance was pitch perfect throughout including a tough breakdown after the climatic match against Riggs. I went into this film fully sure that Riggs actually won the real-life match. For some reason I probably got it confused with his earlier victory against Margaret Court . Carrell looks nearly IDENTICAL to Riggs and was the only actor alive who could possibly play this role. This film is timely and focuses on not only women's rights but LGBT issues as well as we see King and her conflicting relationship with her husband and a female stylist on the Virginia Slims tour. While a bit murky and slow at times, this movie is entertaining and both Carrell and Stone do a great jobs of embodying the real life stars of this monumental match. Stone's tennis game is on point and I'm sure she and Carrell spent a lot of time training for the final match. Once the credits roll and we see the real-life pictures of King and Riggs, we realize just how spot-on the two leads' looks and performances were. 3.5 out of 5 JRs for an accomplished sports movie with a timely and effective message.